During his 1912 visit to the United States, Abdu’l-Baha met an old man early one morning on a deserted New Hampshire street. The man was ragged and dirty. His filthy trousers barely covered his legs. After speaking with the man, apparently trying to cheer him up, Abdu’l-Baha stepped behind a porch, fumbled under his robe, stooped and his trousers fell to the ground. “May God go with you,” Abdu’l-Baha said, giving the trousers to the old man. Then Abdu’l-Baha proceeded as though nothing unusual had happened. The story captures Abdu’l-Baha’s emphasis on deeds and moral action rather than esoteric doctrines. It also captures the belief in human equality which underlies the Bahá’í principle of the oneness of mankind. This was a theme Abdu’l-Baha sounded repeatedly as he traveled across America explaining Baha’u’llah’s teachings. The central principles of the Bahá’í Faith are the oneness of God, the oneness of religion, and the oneness of mankind. The purposes of life, Bahá’ís believe, are to know and worship God and to contribute to the advancement of civilization. 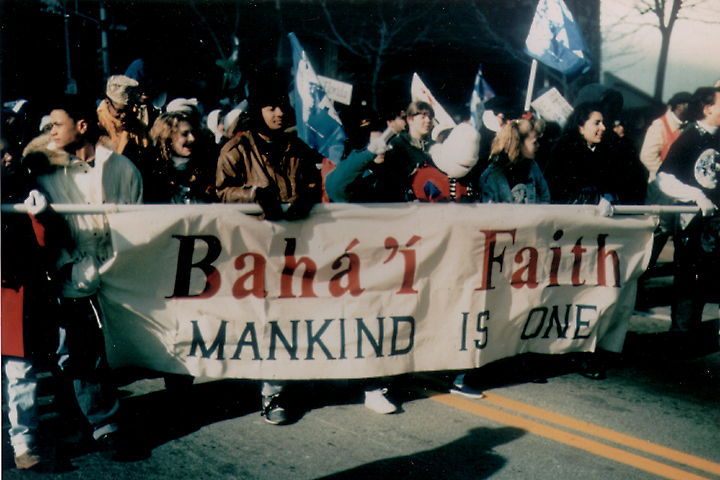 The teachings of the Bahá’í Faith offer solutions to problems that have been barriers to the achievement of this unity and to the establishment of peace in the world. Because of their affirmation of the divine orgin of all faiths, Bahá’ís are actively involved in interfaith dialogue and understanding. When Abdu’l-Baha explained Baha’u’llah’s principles to Americans in 1912, he touched upon many themes. He stressed the importance of independent investigation of the truth; the essential harmony of science and religion; the common foundation of all religions; the equality of men and women; and the need to eliminate prejudice of all kinds and to recognize the oneness of mankind. In order to further these goals he emphasized the value of universal compulsory education; the need for spiritual solutions to economic problems; the benefits of a universal auxiliary language; and the imperative to build a world governing system that could uphold universal peace. The Bahá’í authoritative texts single out racisim as the most vital and challenging issue facing American society. 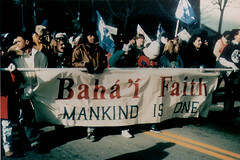 The American Bahá’í community has devoted considerable energy to combat racism nearly since its founding. When Abdu’l-Baha visited the United States in 1912 he refused to use hotels that excluded blacks. He spoke about equality to the fourth national conference of the National Association for the Advancement of Colored People (NAACP). 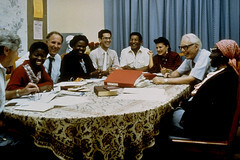 Abdu’l-Baha invited Louis Gregory, a prominent African-American Bahá’í, to a reception for the elite of Washington society, where he seated Mr. Gregory on his right. He encouraged Mr. Gregory to marry a white Bahá’í, stating that their union would symbolize love between the white and black races. The marriage of Louis and Louisa Gregory was the first of many interracial marriages within the Bahá’í Faith, which continues to encourage the practice. Louis Gregory became the first African American to serve on a local Bahá’í governing body (the Washington, DC, spiritual assembly, to which he was elected in 1911) as well as on the national Bahá’í governing body (to which he was elected in 1912). Abdu’l-Baha also made it clear that separate local communities for white and black Bahá’ís could not be established. He required local American Bahá’í communities to be racially integrated. Thus began a long commitment to racial integration and equality in the American Bahá’í community. One result of this commitment is the high level of ethnic diversity within the community which has significant numbers of African American, Persian and Southeast Asian immigrants, Native Americans, and Hispanics. Bahá’ís have become very active in efforts around the country to foster racial understanding and amity. Currently, one of the nine members elected to the National Spiritual Assembly is Native American, and two are African-American, and two are Persian. Promoting equality between the sexes is also a principle stressed in Bahá’í scriptures. While today the American Bahá’í community is fifty percent female and fifty percent male, when it was founded two thirds of Bahá’ís were female, as was true of many new religions in the late nineteenth century. Many of the most active speakers and traveling Bahá’í teachers of the early twentieth century were women. The founders of the Bahá’í communities of Germany, France, South Africa, South America, Hawaii, Japan, and Korea were all American Bahá’í women. Another American Bahá’í woman, Martha Root, traveled the world for twenty-four years teaching the Bahá’í Faith to others. Root was instrumental in arranging for Bahá’í scriptures to be translated into dozens of languages. The first national Bahá’í governing body for North America had three women among its nine members. Today, the National Spiritual Assembly of the Bahá’ís of the United States has five women on it. Despite the prominence of women in Bahá’í organizations, the advancement of women remains an ongoing priority within the American Bahá’í community. In 1990s, the National Spiritual Assembly published a statement on sexual equality in order to give the issue a higher profile.